This would be Marvel Graphic Novel #61 if they were still numbered. Let me start this with a warning to anyone who hasn't read this but intends to: there seems to be a mistake with the date captions in this story. On page one, it tells us that it is February 1988. Later captions give us a linear progression of dates starting on February 4th, 1987. When i saw the first 1987 date, i thought it was the start of a flashback, but the story actually proceeds directly from the events in the "1988" portion. So it seems like the first date is just an error. It's also odd that the first date doesn't give us a specific day or time; all of the other captions do. I almost wonder if an editor decided to change the date of the story at the last minute, maybe trying to help it fit into continuity better, and not realizing that the book is littered with dates. 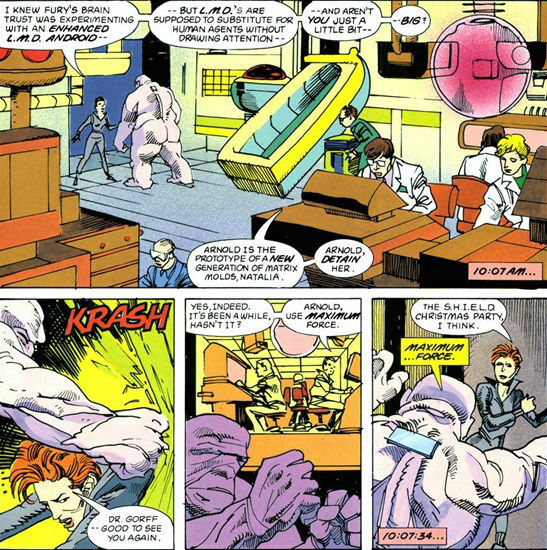 One time jump that is correct is the one at the very end, which shows Black Widow talking with Nick Fury in 1990, after SHIELD "went underground". And i'll actually be placing the story based on that final segment, so the majority of this entry will be considered flashback (which means i won't be listing many of the characters appearing). The story begins with the Black Widow doing a job for Nick Fury, retrieving a data disc from a government agent that was selling it to a foreign agent. After Widow retrieves the disc, she takes it to the drop-off location, a SHIELD agent disguised as a bathroom attendant at a reception party for a Senator. 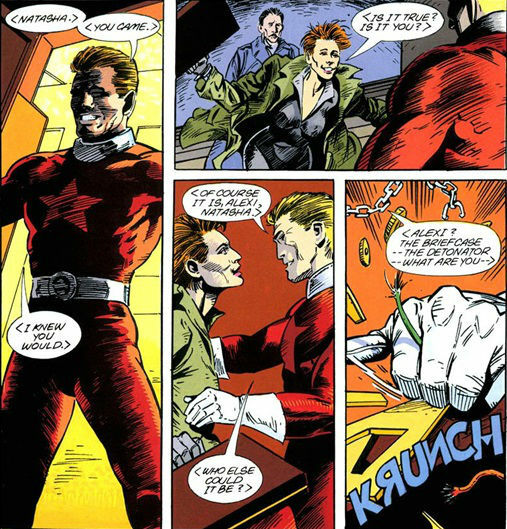 At the party she is approached by a group of Soviets that show her a picture of her husband, the Red Guardian. 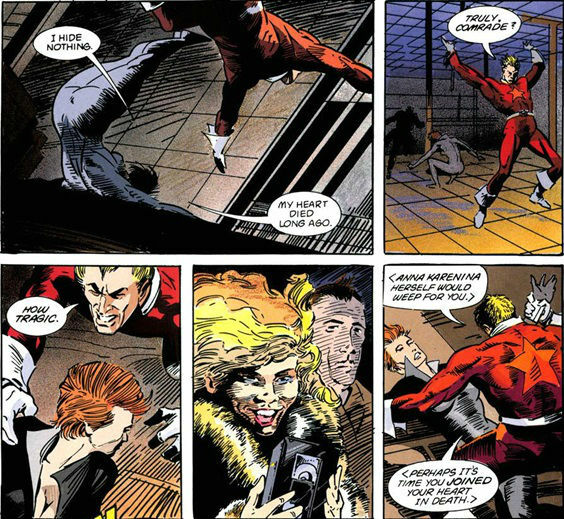 It's said that the Red Guardian didn't actually die after the Widow last saw him (Avengers #44). He was badly injured and had to be surgically reconstructed. He's physically fine now, but he has amnesia. And with Glasnost resulting in budget cuts for the Soviet military, the government can no longer afford to treat him, and he's therefore going to be terminated. Unless the Black Widow will perform a small service for the Soviets, in which case they will bring her to him. All they want her to do is steal a State Department document that just shows the US's position on an upcoming trade conference. The document isn't even classified, so it would be a very small thing for the Widow to steal it. The Widow initially tells the Soviets to leave, but she's seemingly torn. She reaches out to Hawkeye for advice, but hangs up when Mockingbird answers the phone. 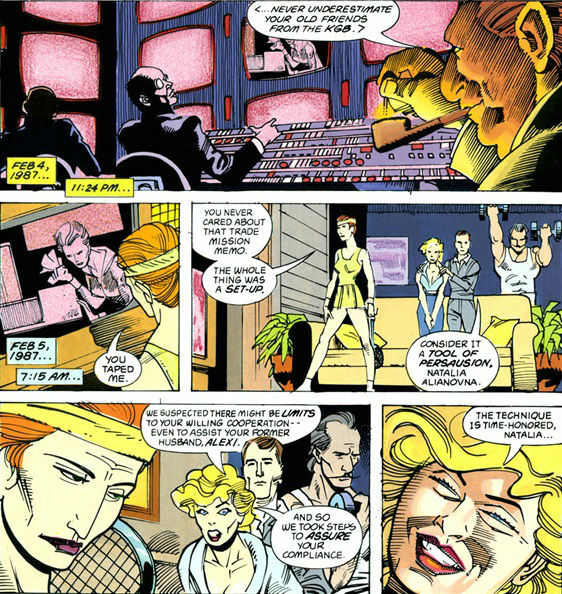 And nearly the same thing happens when she goes to Daredevil, and finds Karen Page in his apartment. 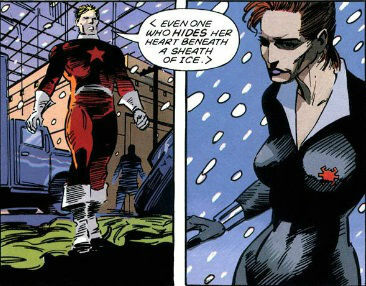 Daredevil still finds her and talks to her, but she doesn't actually say anything to him. Finally, she contacts the Soviet agents and tells them that she'll do it. She successfully steals the document, but we find that the point of the exercise was really to catch the Widow on film doing something against the US, giving them something to blackmail her over. What they really want is for her to steal a new chip used in SHIELD's LMDs. At this point, though, we see that the Widow is actually working a deeper game than the KGB. Black Widow infiltrates a SHIELD base (hidden under a sushi stand on the South Street Seaport) and fights her way past an LMD guardian. She manages to acquire the chip and escape. On the plane ride to the USSR, we get a legitimate flashback. It's the sort of writing that would make Romance novelists blush. In the USSR, the Widow is introduced to her "husband", but he's really a robot. The Soviets wanted SHIELD's LMD chip to complete its programming. So Black Widow has to fight the robot. Eventually she retrieves the chip and destroys the Red Guardian robot. 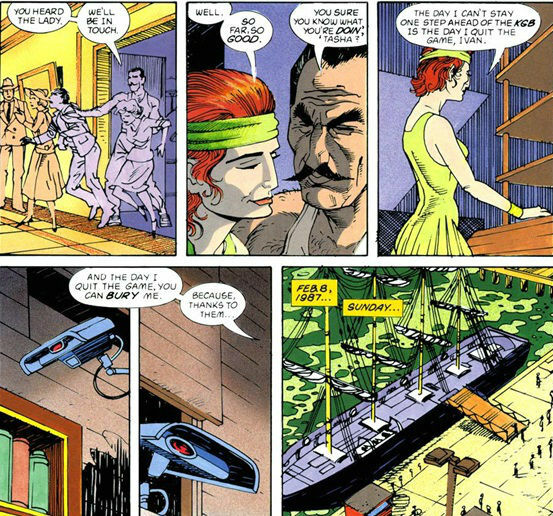 It turns out that the KGB agents were acting without proper authority, while Black Widow actually contacted Nick Fury early on. We then jump ahead three years to 1990. The Soviet Union still existed in 1990, but they were going through constitutional reforms and losing satellite nations, and the end scene is written as if the Cold War is over. Black Widow has been invited to go back to Russia to be a dancer! Considering the normal lead time for graphic novels, my first cynical thought was that this ending was tacked on to keep the story relevant after all the conflict with the KGB. But that's not really likely. The story hinges on the idea that the KGB agents were rogue operatives, and there are other such references (e.g. 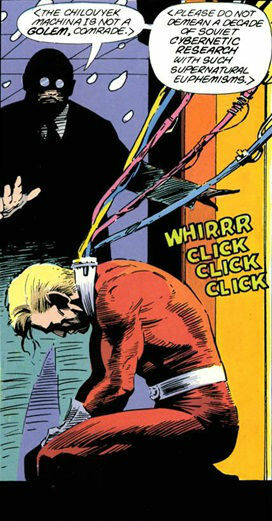 the budget cuts that would have resulted in Red Guardian's termination). So the story does have a natural build up to the (extremely optimistic!) epilogue. I try to give a lot of leeway for artists that do something deliberately stylized, but i really don't like George Freeman's art. Everyone is too gaunt and inhuman looking, and they don't even look consistent from panel to panel (and i'm talking about on the same page, so it's not just a case of the six inkers on the book). Freeman does do well with panel layouts and storytelling, but this is not a story with a ton of action, so if i had to pick between realistic/consistent looking people and good story flow, i would lean more towards the former. And it's not like the action is super-great; it's just competent. 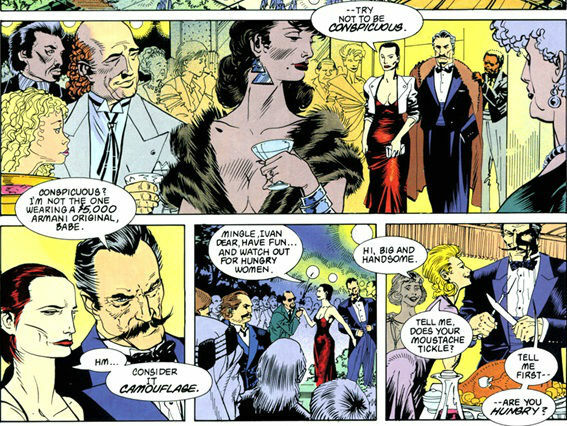 Storywise, Gerry Conway provides a lot of nice twists, great for a spy story. I'm less interested in the idea that she still is still haunted by the death of her husband, a character that never figured much into all of the stories that we've seen about her prior to this. 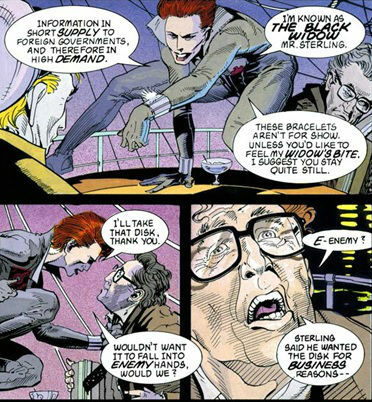 I do like that the Widow was basically in control of the situation the whole time and was a step ahead of the KGB (as opposed to, for example, Nick Fury just sweeping in at the end to save her). 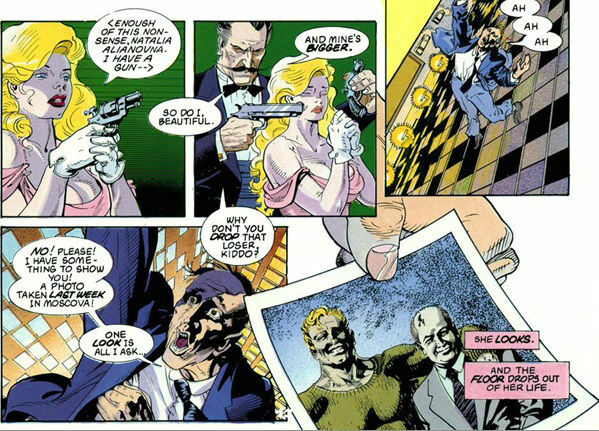 The bigger theme of the issue, thanks to the ending, is interesting as a time capsule. 1990 actually seems a little early to be looking back on the Cold War as ancient history and making statements like "We're all free now", but it does fit with the zeitgeist of the period (i'll point you to Francis Fukuyama's End of History and Jesus Jones' Right Here, Right Now). Chronological Placement Considerations: I'm placing this based on the final sequence in 1990, which takes place "three years" after the rest of the story. Because of that, i have not listed Hawkeye, Mockingbird, Daredevil, Karen Page, or Ivan Petrovitch as characters appearing. I've placed this near Black Widow's appearance in Marvel Comics Presents #53. In terms of Fury's comment that SHIELD "went underground", i'm taking that to mean the fact that SHIELD had a lower profile and a smaller number of members after the reinstatement of the organization in Nick Fury Agent of SHIELD #7. If one wanted to place the main portion of the story, the clues are that Hawkeye and Mockingbird are together and Daredevil is with Karen Page (Daredevil implies that they aren't actually living together, which i don't think was ever true between Born Again and their break-up). 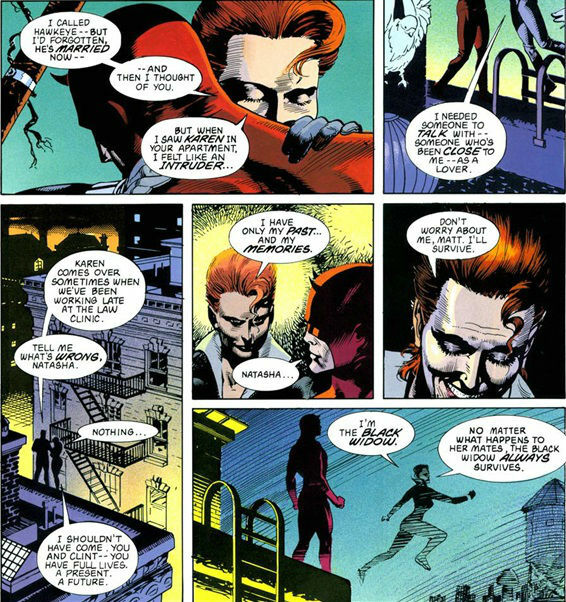 The MCP place the main portion of the story circa Daredevil #252 and West Coast Avengers #29 (and before SHIELD is disbanded). Which, by the way, would put the story in my 1988 category, so if someone did change that first date to get it to fit better in continuity, they were right about that. The original Red Guardian appeared in Avengers #43-44. That story is recapped nearly in full in this issue. 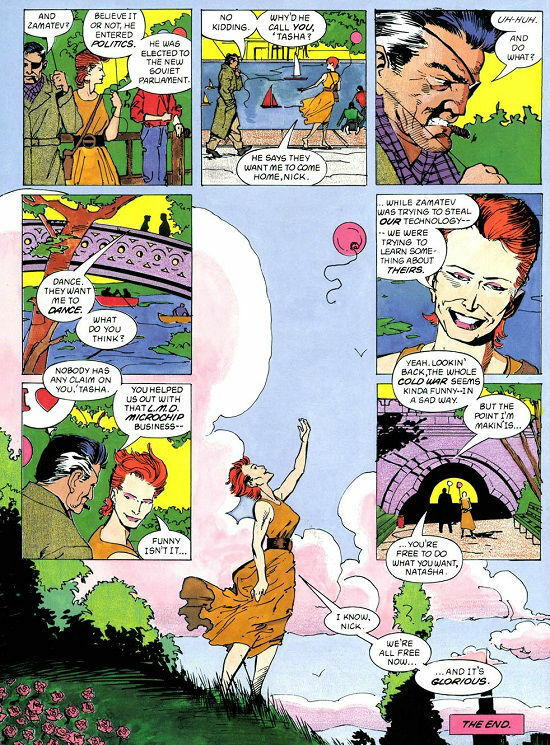 "Follow the Moskva...down to Gorky Park..."
What's Gozer doing in that first panel? Note that this issue features a flashback to the Black Widow's origin, and in contrast to X-Men 268, all the Stalingrad references in Natasha's origin have been removed and it's clear Natasha is under 35. 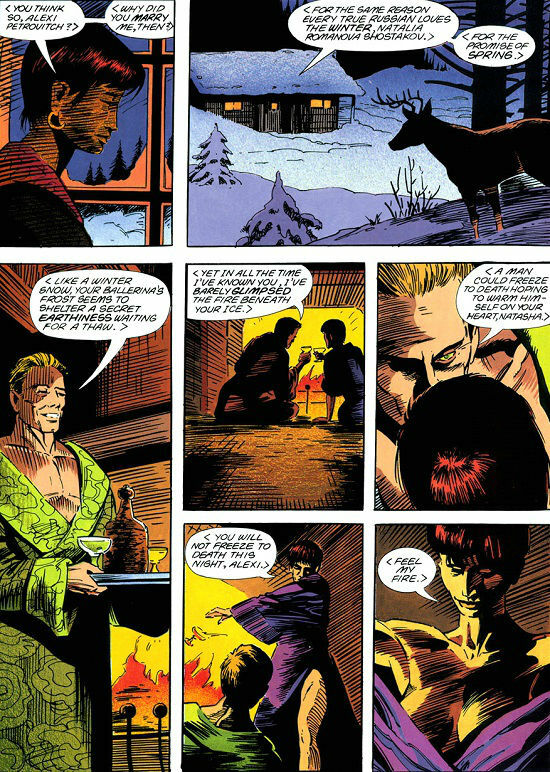 Fnord, I thought it was possible the original story was written in 1987-1988. Otherwise, there's no real reason the main story couldn't have taken place a few months ago, without the references to Clint and Matt. Glasnost started in 1986 and rogue Soviet operatives are a common staple of spy fiction. I appreciate Black Widow solo stories, but I didn't like the art in this story.